Apple plans to introduce HDMI connectivity on some of its Macs this year, according to a number of sources close to the company. HDMI input has become the de facto industry standard high-definition audio/video interface on most PCs on offer from Apple's competition. HDMI ports were spotted on a Mac mini prototype (in place of its legacy DVI connector), which is where the current spate of Apple embracing HDMI rumours emerged from. The HDMI port sits beside the mini's DisplayPort connector and – should it see commercial release – the new Mac mini would be the second Apple product to feature the port following the Apple TV streaming media device. HDMI provides support for audio, which is something Apple's current DVI output does not. Appleinsider also notes that: "At least one of the Mac mini prototypes described by those privy to the hardware is said to include Nvidia's MCP89 chipset, which is the successor to the existing MCP79 (or GeForce 9400M) chipset found alongside Intel's Core 2 Duo processors across the majority of Apple's existing Mac product line. "However, Intel's ongoing licensing dispute with Nvidia will prevent Apple (and other PC makers) from using the MCP89 supporting chipset alongside its latest generation of Nehalem-based Core i3, i5 and i7 processors. Therefore, this suggests that Apple may continue to rely on existing Core 2 Duo (pre-Nehalem) processors as part of its upcoming Mac mini revision. 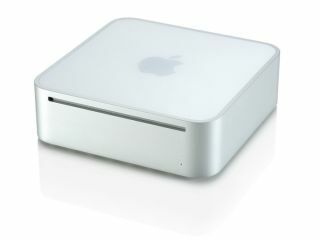 "Alternatively, the Mac mini prototype in question could have been in development before Intel's disagreement with Nvidia came to a head, meaning successive prototype revisions that forgo the new Nvidia chipset in favor of Intel's may have since emerged, though there's no evidence thus far to support that theory."